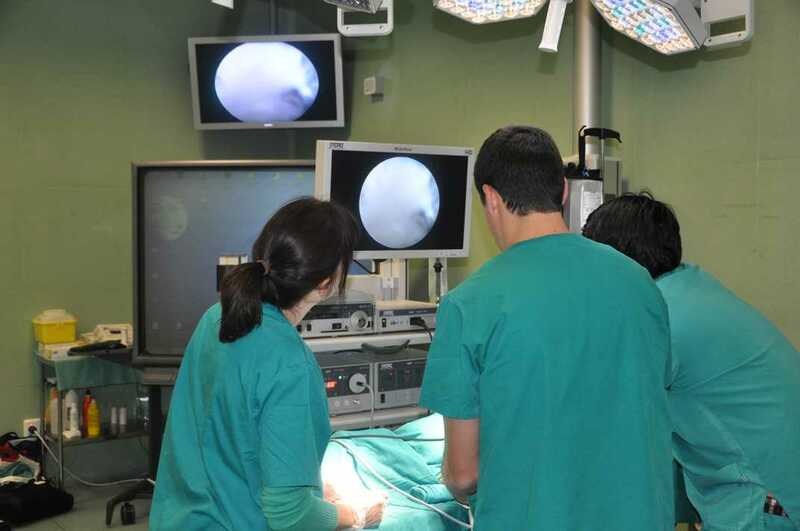 The Jesús Usón Minimally Invasive Surgery Centre (JUMISC) works in a R&D project, that aims to find a biomaterial that will help injured cartilage to repair. The targets of the project are to design a biomaterial that could be implanted in the human body and to apply it in the osteoarticular pathology treatment. The main goal is that people who suffer from osteoarthritis, a pathology that damages the cartilage joint, get better through a minimally invasive surgery procedure. The consecutive phases of the project will be the development of the biomaterial, tests in vitro and the preclinical trials, as testing in pig animal model. After finishing these phases, vet professionals will monitore them, through imaging and surgery techniques, using MRI scan and arthroscopy, to study the evolution of the injuries. At the end of the R&D project, those injured joints where the biomaterial was implanted, will be analyzed through microscopy techniques, and vet professionals will determine if the cartilage has improved. JUMISC and the partners of the project (enterprises, hospitals and others) are focused on testing that the treatment is safe and effective, and from this premise we will be ready to start clinical trials in hospitals, in order to demonstrate the effectiveness of the biomaterial in patients.